Introduction: Parental preference for a dual-trained orthodontic provider has not been reported in the literature. Our objective was to determine what preference, if any, decision-makers would have for a dual-trained orthodontist. Materials and methods: A paper-based 22-question survey was designed to assess the factors that are important to decision-makers when choosing an orthodontist. The preference for dual-trained provider was also assessed. Additionally for the first time we also examined what factors would cause decision-makers to change their minds regarding an orthodontic provider. The survey was administered to the parents or guardians while their children received routine dental care at 3 different pediatric dental offices. Results: Respondents indicated two factors as most important when choosing an orthodontic provider; doctors displaying a caring attitude and doctors who had a good reputation. Other factors were also deemed important. When considering the type of orthodontic provider, traditional provider verses dual-trained, 79% of respondents indicated their preference for dual-trained providers. Additionally, 74% of respondents indicated they preferred to have all their child’s dental care (preventative/restorative/orthodontic) provided by a single provider. Conclusion: Our results indicate that there is a strong preference for dual-trained orthodontic providers among our respondents. As the future of orthodontics as a cottage industry is analyzed in today’s changing dental economic environment new approaches to meet the preferences and needs of patients and their parents should be considered. The orthodontic literature contains very little information regarding dental practitioners who have advanced training in both Pediatric Dentistry and Orthodontics. Parental preference for this type of orthodontic provider has not been reported in the literature. The dental literature calls these uniquely trained practitioners “dual-trained pediatric dentistry and orthodontic specialists . Among Orthodontists, there are a small number of practitioners who have completed a second dental specialty in Pediatric Dentistry. Hilgers et al. in a survey of 492 diplomats of the American Board of Pediatric Dentistry revealed that only 7% were dual-trained, making dual-trained orthodontists a definite minority among practicing orthodontists . Perhaps this number is even high given the selection bias of Hilgers survey, a similar study among members of the American Association of Orthodontists was not found in the literature, nor does the American Association of Orthodontists membership office track this information. The concept of a combination of specialties is not new; the idea had been promoted as early as 1930 by Millberry . Lamons observed that pediatric dentistry and orthodontics in a combination practice might provide services that are equal in quality to that expected when these specialties are practiced separately. He stated further that the combination of the two specialties may offer services with certain advantages to the patient as well as to the practitioner . Kohn stated that there is a closer didactic and clinical relationship between these two specialties than between any other two specialties . Ackerman again in 1975 proposed the combination of specialties stating that many graduate courses are duplicated in each program . Despite these sentiments the two specialties have remained largely independent. The Commission on Dental Accreditation defines the specialties of Orthodontics and Pediatric Dentistry as follows: 1) Orthodontics and Dentofacial Orthopedics: “the dental specialty that includes the diagnosis, prevention, interception and correction of malocclusion, as well as neuromuscular and skeletal abnormalities of the developing or mature orofacial structures .” 2) Pediatric Dentistry: “is an age-defined specialty that provides both primary and comprehensive preventive and therapeutic oral health care for infants and children through adolescence including those with special health care needs ”. In medicine, peer-reviewed literature documents improved quality, reduced errors, and increased satisfaction when patients identified with a primary care medical home . The concept of primary care providers exists in dentistry as well. General dentists and pediatric dentists are considered “Primary Oral Healthcare Providers”; both of these practice settings represent a patient’s dental home. As such they traditionally function as gatekeepers for referrals to other dental specialists. Orthodontists are considered “Secondary Oral Healthcare Providers.” A dual-trained provider is unique in that he or she is both a “primary” and a “secondary’ oral health care providers for their patients. Multiple investigators [9-11] have examined different factors that affect a patient or parent’s choice when choosing an orthodontist. Utilizing surveys, these investigators analyzed various qualities of a traditional orthodontic practice. Reportedly there are three different groups of qualities that are important for patient/parent preferences in the literature: 1) Receiving a referral from a trusted source; 2) A doctor’s personal qualities; 3) A practice’s convenience qualities for the patient/parent. St. Louis et al. . Developed a statistically validated and reliable questionnaire to determine the relative importance of orthodontic office and doctor characteristics to patients and/or parents when choosing an orthodontic provider for themselves or their child. After analyzing 43 different orthodontic practice characteristics they determined that 6 predictive factors were statistically significant . These practice factors/characteristics were as follows: 1) A doctor with a caring attitude; 2) An office that accepts the patient’s insurance; 3) An office with a good payment plan; 4) A doctor with a good overall reputation; 5) A referral from a family or friend; and 6) A referral from the patient’s dentist [11-14]. The purpose of this study was to determine parental preferences utilizing these 6 predictive factors/characteristics in determining parental preference for a dual-trained orthodontist. To accomplish this goal a 22-question survey instrument was developed. Responses were obtained from 3 different private Pediatric Dental offices. The hypothesis being tested is that parents will have a preference for a dual-trained orthodontist when given a choice. 1. Do you have child/children between the ages of 10 and 18 years old? 2. Do you think your child/children will need braces? 3. Will you be the primary decision-maker when choosing an Orthodontist for your child? 4. Are you the adult who plans on driving your child/children to his or her orthodontic visits? Subjects who did not answer “yes” to the first four questions of the survey were excluded from participation. Additionally, subjects who did not complete all survey questions were also excluded. The subsequent 18 questions utilized ordinal, categorical and interval responses to measure the factors related to parental preference for type of orthodontic provider. These survey questions were an adaptation of prior survey questions proven to be predictive for preference when choosing an orthodontic provider. Particular emphasis was placed on the following 5 factors, which previous investigators found to be the most predictive of choice for a provider. 1. Receiving an orthodontic referral from somebody you trust, like a relative, friend or your child’s doctor. 2. Feeling that the Orthodontist has a caring attitude. 3. Believing the Orthodontist has a good reputation. 4. Having the office accept the patient’s insurance. 5. Having an office that provides a good payment plan. Measures were taken to decrease bias and increase the validity of the survey questionnaire. To decrease selection bias the three pediatric dental practices were selected purposefully and varied by location by either state and/or practice setting (i.e., suburban or urban). Gender and socioeconomic status information were collected. No identifying information was collected from subjects other than the location at which they took the survey. Survey construct, face, and content validity were controlled for utilizing the following methods. Construct validity was addressed during the construction of the survey by utilizing practice factors that previous investigators had validated as important and predictive to decision makers regarding choice of an orthodontic provider [9,11,12]. A limited field test was performed in an effort to control for face validity. Comments and suggestions from the field test were used to improve the wording and understandability of the survey. Constructing the survey questions with the aid of a group of private practice and academic orthodontic and pediatric dental providers aided in controlling for content validity. Completed surveys were collected and placed in a sealed envelope. Data was then compiled by one investigator (MBJ) in a spreadsheet program (Excel, Microsoft, Redmond, Wash.) for ease of computation with the use of SPSS statistical software. The Jacksonville University Institutional Review Board approved this study (Appendix). A total of 90 surveys were sent; 82 were returned, for a response rate of 91%. Of the 82 surveys, only 66 met the inclusion criteria for the survey, for a final response rate of 73%. Sixteen respondents that either did not answer, “yes” to the first 4 qualifying questions or did not complete all the questions in the survey. 48 responses were collected from two suburban pediatric dental practices. 18 responses were collected from one pediatric dental office located in an urban setting. The three pediatric practices varied by region of the country. Of the 66 qualifying respondents, 44 came from practices located in the Western U.S. and 22 from the Midwest. Demographic traits of respondents are shown in Tables 1-3. Respondents were predominantly Mothers (88%), Fathers and “Other” comprised (8%) and (5%), respectively. Fifty-six percent (56%) of the respondents had one child between the ages of 10-18, while (44%) of respondents had more than two or more children. Of the respondents, (28%) had annual household incomes below $49,999, (33%) had incomes between $50,000- 99,999 and (39%) had incomes over $100,000. Table 2: Number of qualifying children of each respondent. Table 3: Annual household income. On a scale of 1-4, with 4 being very important and 1 being not important, respondents reported that on average the 5 predictive factors had an average importance value between 3.68-3.95 (Figure 1). Although statistically there was no difference between the 5 predictive factors, factor #2, Caring Attitude, and factor #3 Good Reputation had the highest average values: 3.94 and 3.95, respectively. Participants were given a brief description of two different orthodontic providers–Providers “A” traditional orthodontic provider versus provider “B” a dual-trained provider–and they were asked based on this description alone which type of provider they preferred. Seventy-nine percent (79%) of respondents stated that they preferred a dual-trained provider, while 17% preferred a traditional orthodontic provider and 5% responded that they didn’t have a preference (Figure 2). Figure 2: Preferred orthodontic provider. Respondents were asked, “After then meeting each provider, which of the 5 factors would cause them to change their original choice of provider”. 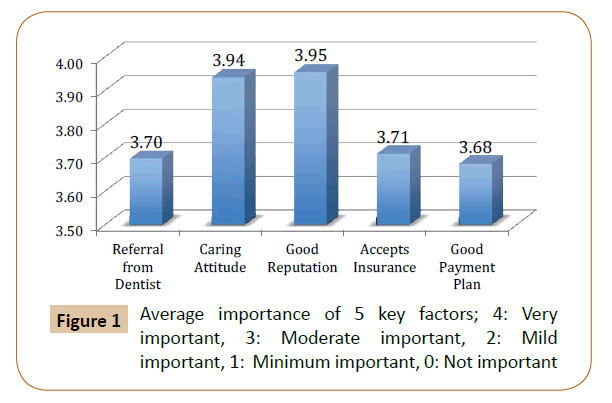 Respondents indicated that “feeling that the other provider had a more caring attitude,” “only second office accepted their insurance,” and “receiving a recommendation from their current dentist or physician” were all reported as significant factors that could cause respondents to change their minds about choice of provider (Figure 3). Figure 3: Factors that would change a parent’s provider choice. Analysis using the Friedman Nonparametric Test for Related Samples resulted in a sig. value of 0.041. Sig. p-values were set at 0.05 resulting in 0.041<0.05. It can be concluded that there is a significant difference in the responses to the six questions regarding the 5 predictive factors. 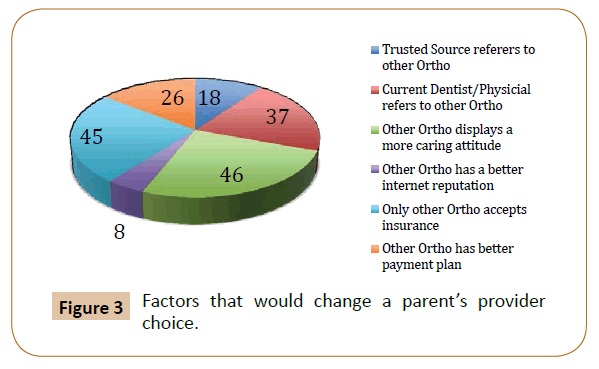 However, having a “good payment plan” or “having a good reputation on the internet” have little effect on anyone's decision to stay with a traditional orthodontist, while about half of the respondents are willing to switch if referred by a friend or doctor, or if the doctor accepts their insurance or is found to have a caring attitude (Table 4). Respondents were stratified based on employment status; 47% were full-time employees, 21% were part-time employees and 32% were either unemployed or not employed outside the home (Table 5). Analysis showed that having the orthodontist near one's home, close to the child's school, or close to the child's pediatrician, or having all dental services in one office, did not elicit significantly different responses based on employment status. As to the question of how important it is to be near the child's dentist, the results showed insignificant differences (sig. value=0.017<0.05). Most full-time employees didn't find it to be important, virtually every part-time employee found it unimportant, and unemployed respondents were evenly split on whether it was important to be in close proximity to their child’s dentist (Tables 6 and 7). Table 6: Employment status vs. My orthodontist is close to my child's dentist. Five convenience factors were also evaluated. Respondents were again asked to consider their original preference for orthodontic provider and which convenience factors would cause them to change their choice of provider. The most important factor reported was that the orthodontic provider be near their home, with having all dental services at one location being the second most important factor (Figure 4). 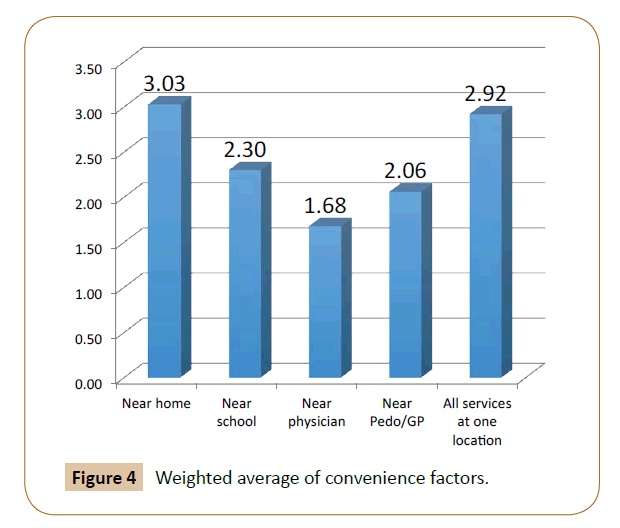 Figure 4: Weighted average of convenience factors. When the 66 respondents were asked how much time they would be willing to drive to attend orthodontic visits, 18 of 66 (27%) responded “Less than 15 min”, 43 of 66 (65%) responded “15- 30 min”, 55 of 66 (8%) responded “greater than 30 min” (Figure 5). 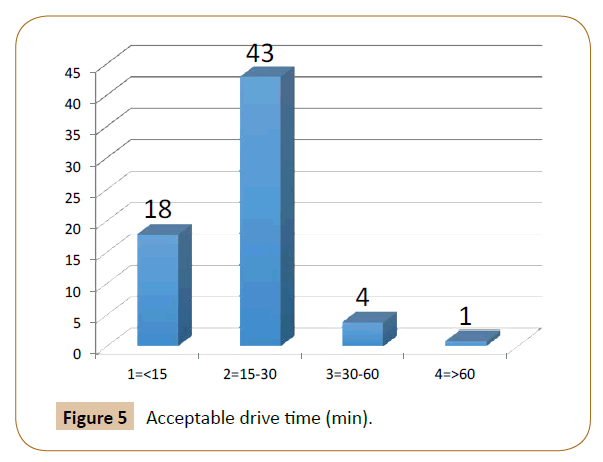 When questioned if drive time alone would cause them to switch from their choice of provider, 52 out of 66 (79%) indicated that they would not change their choice of provider but 14 of 66 (21%) stated they would change their choice of provider based on drive time alone (Figure 6 and Table 4). For the 21% that would change their choice based on drive time alone, a 10 min drive time difference seemed to be the threshold for switching (Figure 7). Figure 5: Acceptable drive time (min). Figure 6: Number willing to switch ortho based on drive time alone. 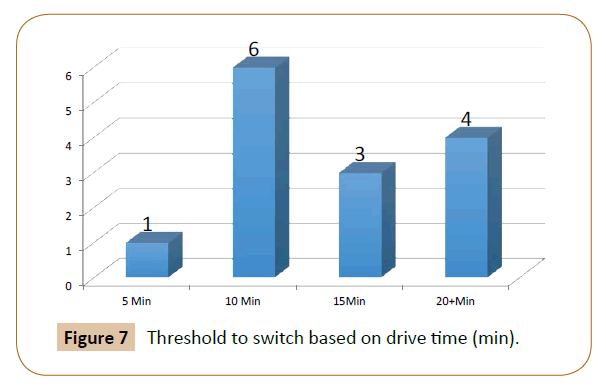 Figure 7: Threshold to switch based on drive time (min). Despite regional and practice setting differences among participants, 49 of 66 (74%) indicated that having all their children’s dental procedures done at one location was either moderately or very important (Table 8 and Figure 8). Table 8: Importance of all dental work at same location. Figure 8: Single location preference (% of respondents chose moderate and very important). The literature reports that 41% of patients will visit more than one orthodontic office before choosing an orthodontic provider . The economics of today’s orthodontic practice are nothing like what they were 15-20 years ago. Long gone are the days of loyal referring general practitioners and an atmosphere of exclusive rights on the practice of orthodontics. A 1988 study by Koroluk et al. found that 62% of the pediatric dentists and 17.9% of the general practitioners surveyed provided comprehensive orthodontic treatment . Galbreath et al. found that 50-57% of all master’s level members of the Academy of General Dentistry provide some type of orthodontic services in their offices . This data suggest that today’s orthodontic graduate needs be prepared for competition. Unique among orthodontic providers are those who are dual-trained. The purpose of this study was to determine parental preferences when choosing between a traditional and a dual-trained orthodontic provider. Not surprisingly, our findings indicate that mothers are the major decision-makers when considering an orthodontist for their children. Walley et al. similarly found that 85% of mothers were the decision-makers when choosing an orthodontist . The weighted importance of each mother’s response is magnified by our finding that 44% of mothers had more than one child who they perceived would need braces. Although the majority of respondents lived in suburban areas, the region of the country or the size of the city in which the practice was located had little effect on decision-makers when choosing an orthodontic provider for their children. Employment status seemed to be independent of parental responses for preference. This finding was somewhat unexpected as it was assumed that the busier parents were, the more likely that convenience would be a major factor in choice of a provider. Our results showed that the two most important factors when choosing between orthodontic providers are the perception on the part of the decision-maker that the doctor has a caring attitude and the doctor’s reputation. These findings are in harmony with the findings of several other investigators [9-12]. Interestingly, although reported as important, Internet reputation and having a good payment plan were not as important as other factors. Therefore, the importance of the doctor-patient or doctor-parent relationship in orthodontics should not be underestimated. Sinha et al. stated that the successful practice of orthodontics is significantly dependent on the interaction between the orthodontist and the patient. These relationships can positively influence treatment outcomes by encouraging cooperation throughout a lengthy orthodontic procedure. They concluded, “Time invested to establish rapport with patients will be less than that required to correct the potential difficulties resulting from failure to do so” . Daniels et al. stated, “orthodontic patients' cooperation determines their treatment outcomes” [17,18]. Generally speaking, closer relationships with patients are built over time and through multiple encounters with that Doctor and their staff. Most interesting to this study was the finding that 79% of decision-makers preferred a dual-trained orthodontist. In light of the importance of relationships, one could infer that if a patient/parent had a long-standing preexisting relationship with their dual-trained pediatric dentist/orthodontist they would prefer to use this provider when their child needed orthodontic care. In fact, our results indicated that 74% of respondents preferred to have all their child’s dental care done at the same location. Our results also showed that it was not as important to our respondents that their child’s orthodontist be located near their dentist. One way to interpret these two findings would be to infer that parents not only preferred it when both pediatric and orthodontic services were provided at the same location, but that they considered it important that these services were provided by the same doctor. This makes particular sense when one considers the findings of Mascarenhas et al., “The quality of orthodontic care, when measured by parental satisfaction, was similar between orthodontists and pediatric dentists. This indicates that, as far as parents are concerned, pediatric dentists performed orthodontic treatment to the same high standard as orthodontists” . Continued research is needed in the area of parental preference for orthodontic provider characteristics. Parental surveys are subject to many shortcomings. Our study could have been improved by ensuring the reliability of the survey instrument, as a test-retest of subjects was not performed. Despite efforts to control for face validity with field-testing; some respondents seemed confused by some of the language questions. Despite simple instructions to the staff members administering the survey there was some confusion regarding the inclusion criteria for participation in the survey. This was evidenced by the fact that we had to disregard 18% of the surveys we received. A larger sample with broader demographic could also yield different results. In retrospect, more pointed questions could have been asked as to why each respondent choose a particular provider, and respondents could have been given space to write in their own personalized responses. Our study added new information regarding preference for dual-trained orthodontic providers. Like other studies our findings indicated that the doctor-patient relationship is not only important to the successful orthodontic treatment, but to initial choice of orthodontic provider. New orthodontic providers should be aware of the factors that drive parental choice of orthodontic provider, especially the importance parents place on the orthodontist’s caring attitude. The importance of convenience factors should also not be underestimated. Today’s dental economic environment is changing rapidly, orthodontics as a cottage industry could become a thing of the past. This is largely due to the fact that corporate dental model is expanding at an ever-increasing rate. Not to mention the high cost of orthodontic education. It is difficult for the new private practitioner to compete against corporate giants with deep pockets and the accompanying economy of scale these multipartite organizations provide. A new trend in the corporate model is the grouping of multiple dental specialties under one roof. This undoubtedly appeals to many patients who value convenience when choosing a dental home. It’s nice to have all your dental needs met at one location, not unlike the big box stores we are all familiar with. Perhaps the most important finding of our study is that parents prefer not only the convenience of having all their child’s dental services at one location, but that they also prefer having one doctor provide all their dental. The corporate model does not yet contain this type of provider. If orthodontics as a profession is to temper the corporate storm, orthodontic educators should consider integrating orthodontics with primary care dentistry. A dual-trained pediatric dental/ orthodontic provider could very well be the perfect solution to all the needs and preferences of the population they serve. Further research is needed to better understand other factors that might affect a parent’s preference for an orthodontic provider. Hayakawa S, Jedrychowski JR (1994) Practice characteristics of dual trained pediatric dentistry and orthodontic specialists. ASDC J Dent Child 61: 186-191. Hilgers KK, Redford-Badwal D, Reisine S (2003) Orthodontic treatment provided by pediatric dentists. Am J Orthod Dentofacial Orthop 124: 551-560. Lamons FF (1948) Pedodontics and orthodontics; a combination practice. J Am Dent Assoc 36: 56-63. Kohn SI (1968) Can pedodontics and orthodontics be combined in practice? ASDC J Dent Child 35: 241-251. Ackerman JL (1975) The future role of orthodontics in the specialty education and practice of dentistry for children. ASDC J Dent Child 42: 266-274. Accreditation COD (2013) Accreditation standards for advanced specialty education programs in orthodontics and dentofacial orthopedics. Accreditation COD (2013) Accreditation standards for advanced specialty education programs in pediatric dentistry. Rosenthal TC (2008) The medical home: growing evidence to support a new approach to primary care. J Am Board Fam Med 21: 427-440. St. Louis BL, Firestone AR, Johnston W, Shanker S, Vig KW (2011) Prospective patients rate practice factors: development of a questionnaire. Am J Orthod Dentofacial Orthop 139: 235-241. Sinha PK, Nanda RS, McNeil DW (1996) Perceived orthodontist behaviors that predict patient satisfaction, orthodontist-patient relationship, and patient adherence in orthodontic treatment. Am J Orthod Dentofacial Orthop 110: 370-377. Walley EK, Silberman SL, Tuncay OC (1999) Patient and parent preferences for orthodontic practices. Clin Orthod Res 2: 110-123. Edwards DT, Shroff B, Lindauer SJ, Fowler CE, Tufekci E (2008) Media advertising effects on consumer perception of orthodontic treatment quality. Angle Orthod 78: 771-777. Moderator's Full report (2005) American Association of Orthodontists AQR. Consumer Orthodontics Study with Patients and Non-patients (1997) American association of orthodontists MsR. Research and Planning Group. Koroluk LD, Jones JE, Avery DR (1988). Analysis of orthodontic treatment by pediatric dentists and general practitioners in Indiana. ASDC J Dent Child 55: 97-101. Galbreath RN, Hilgers KK, Silveira AM, Scheetz JP (2006) Orthodontic treatment provided by general dentists who have achieved master's level in the Academy of General Dentistry. Am J Orthod Dentofacial Orthop 129: 678-686. Gerbert B, Bleecker T, Saub E (1994) Dentists and the patients who love them: professional and patient views of dentistry. J Am Dent Assoc 125: 264-272. Daniels AS, Seacat JD, Inglehart MR (2009) Orthodontic treatment motivation and cooperation: a cross-sectional analysis of adolescent patients' and parents' responses. Am J Orthod Dentofacial Orthop 136: 780-787. Mascarenhas AK, Vig K, Joo BH (2005) Parents' satisfaction with their child's orthodontic care: a comparison of orthodontists and pediatric dentists. Pediatr Dent 27: 451-456.